As a retrospective on 2015 – a year full of impactful developments in the pharmaceutical quality regulatory arena – IPQ is providing a listing of the stories that generated the largest readership. The two stories that led the 2015 list are provided in full. While the two have an FDA orientation, both have important implications for the international efforts to advance quality regulation and better connect its review and inspection components. The stories that follow in our “most read” listing (see p. 2) speak clearly to the depth and breadth of IPQ’s coverage and its mission of supporting the global dialogue. Making dissolution testing and the Biopharmaceutics Classification System (BCS) it supports more meaningful is high on the agenda of the Office of Pharmaceutical Quality (OPQ) as it works with the Product Quality Research Institute (PQRI) to advance the quality regulatory process. Pharmaceutical manufacturers are starting to find the process-capability holy grail of six sigma – a goal that many thought not long ago was unattainable for pharma. The impact of continuous manufacturing (CM) on the ability of pharma to fully implement quality by design (QbD) and realize its benefits is becoming clear as the technology moves into full operation. The positive impact that FDA’s Office of Pharmaceutical Quality (OPQ) has had during its first year in operation includes the extra support the agency has been able to provide for emerging technologies, as witnessed by the agency’s first approvals of drug products using continuous manufacturing and 3D printing. FDA’s Office of Pharmaceutical Quality (OPQ) has adapted the risk-ranking model developed for abbreviated new drug application (ANDA) reviews to its review of drug substances, with the goal of improving communications internally and with industry regarding API risks and deficiencies, and in turn, the overall efficiency and predictability of the process. FDA’s vision of a quality regulatory process that would be more efficient, science-based, review/inspection coherent, and process improvement and product supply friendly took more concrete shape during 2015. 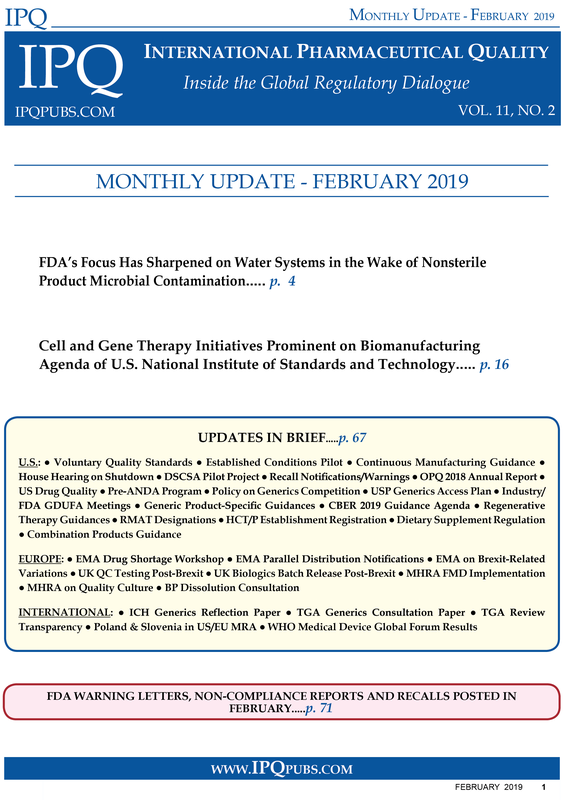 The January Monthly Update explores what the progress looks like across CDER’s Offices of Generic Drugs and Pharmaceutical Quality. Also in focus is the complex web of challenges that a global drug distribution system presents in trying to identify and trace products and what regulators and industry are trying to do to deal with it. The vision of having a product quality dashboard that would help guide FDA in regulating drug product lifecycles is emerging into more concrete form as the Center for Drug Evaluation and Research (CDER) Office of Pharmaceutical Quality (OPQ) begins its second year. FDA reviewers are reporting that firms producing active pharmaceutical ingredients (APIs) are not always providing adequate information on their starting material (SM) decisions or on the fate and purge of process impurities in their Type II drug master file (DMF) applications.